Aw that went so fast! 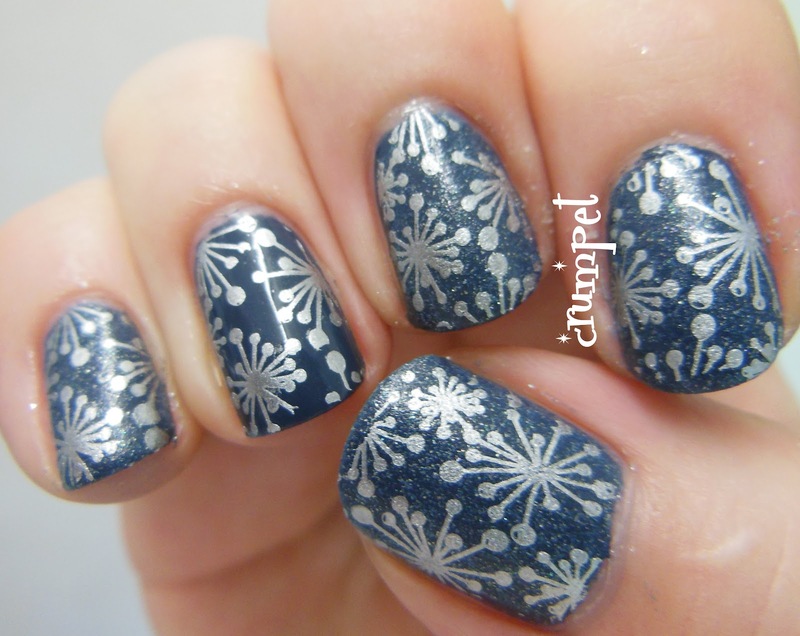 We're ALREADY at the end of Blue Week :( I hope you've been clicking on the other links each day, there have been some truly special manis out there. Special shout out to Bee who did her own spin, did a Day 1 mani, and then for each subsequent day added something to it. Honestly, 5 looks from 1 mani? That's hard! I think part of why I've had so much fun is that these ladies are actually my bestest blogging friends too, so it's like a special little family :) Talking of special, we'll be back in about 3 weeks ... and next time, we'll be getting spooky !!! 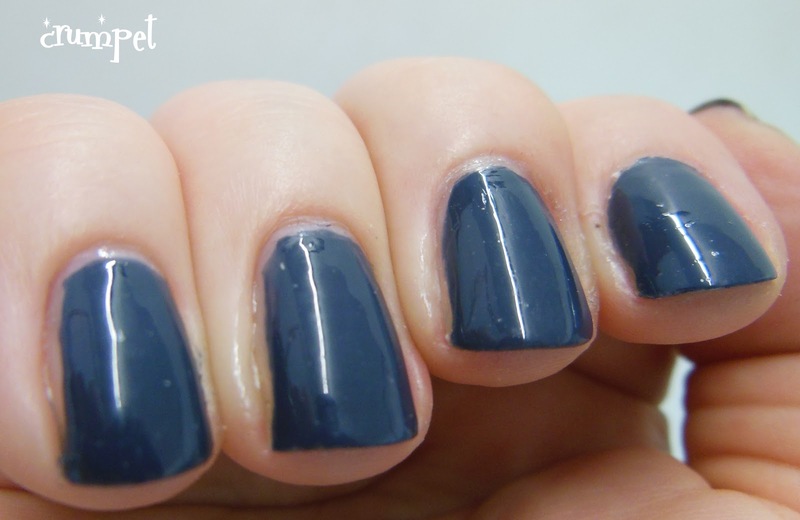 So, I've chosen to end the week as I began it, with one of Zoya's new blues. This is Natty, and we're really not sure whether we like each other. 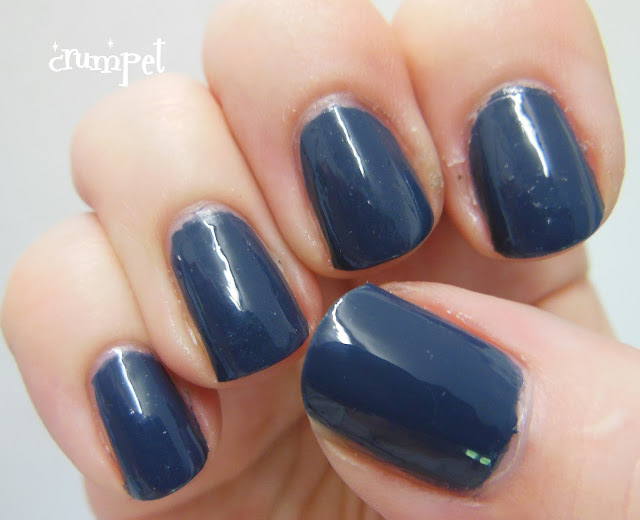 Natty is a smoky medium blue - think medium grey, and add a dash of blue. She reminds me very much of last year's Petra, but I don't have that polish so can't compare them. 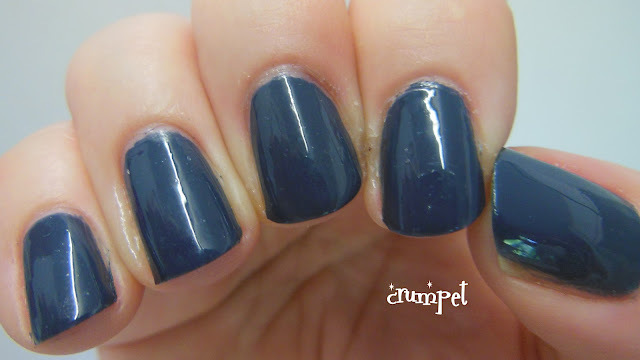 I only have 2 other polishes close to this shade, a Bettina and a Nubar, both from their "Jeans" collections. There is a lovely faded feel to this ... in the bottle. On the nail, not so much. It dries at least 2 shades darker, and that's where it all goes wrong for me. It makes it darker, but not dark; darker, but less blue; darker, but less smoky. It's like it dries all the subtlety out of it. 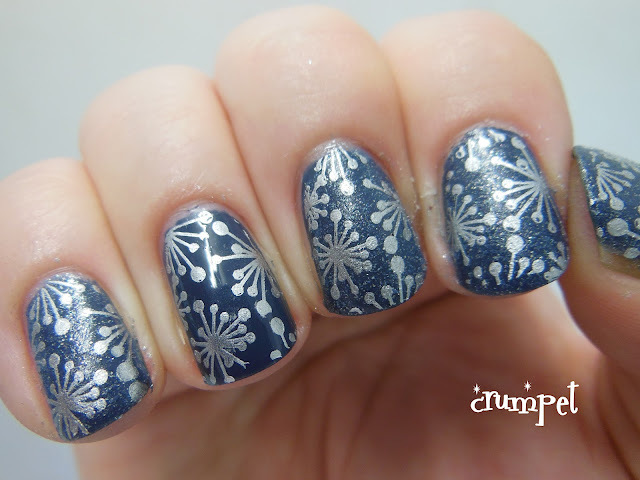 My plan was to do a Saran Wrap mani, and take a lovely smokey creme (allegedly) and roll it around in some lighter, brighter blue. I picked up Zoya Skylar - the lovely tone and the fabulous shimmer looked as if it would make a fabulous contrast ..... But no. Apparently, shimmers don't like the saran wrap shimmy, so what I ended up with was a matted version of what I had before. I don't dislike it ... but it's not what I was aiming for. Holy cow, it's going sooooo well! So far, so .... Lol, I really didn't know WHAT to do at this point. So, when in doubt, stamp it out! I had just received my amazing new stamping plates from Llarowe, and 1 particular pattern kept winking at me from LLC-A. And hello awesome mani !!!! I LOVE THIS !! This is why sometimes it's a good idea to keep going. 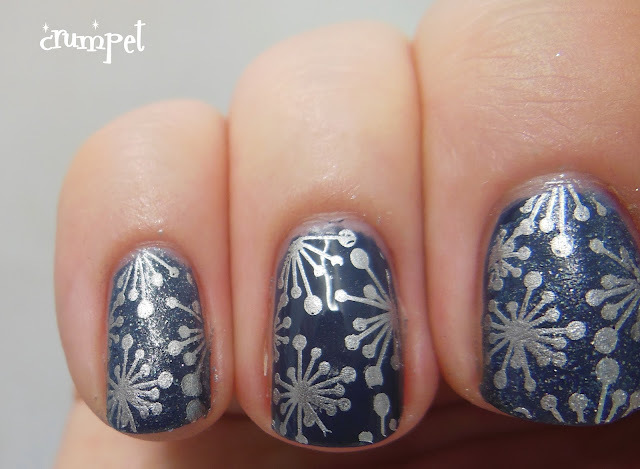 Everything about this mani now works. The silver stamp, the accent nail, the Skylar ... love it ... love it.